“Today’s youth face many challenges as they grow up”. Said foundation president Crista Walker. “The Dallas Police Youth Foundation supports the efforts of the Dallas Police Department’s youth outreach programs to provide positive interaction between police officers and kids. The officers, while teaching the Six Pillars of Character, are also being positive role models”. 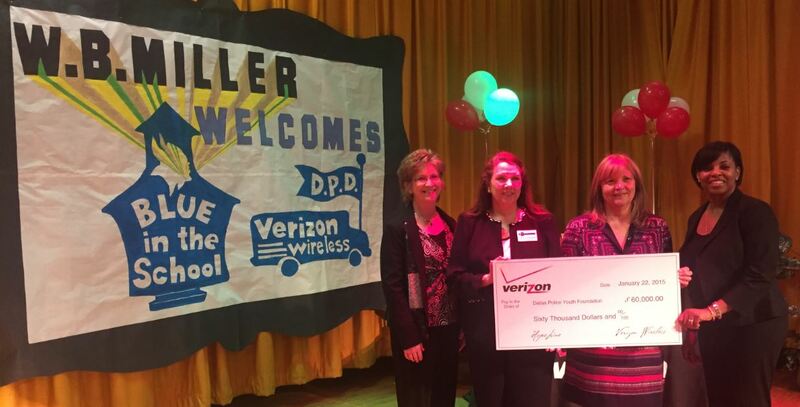 The 2014 fall session of Blue in the School concluded January 22, 2015, with a closing celebration at the William Brown Miller Elementary School, where Verizon presented the Dallas Police Youth Foundation with a $60,000 grant. The grant will support the foundation’s outreach efforts to engage and mentor Dallas-area youth. Blue in the School is a four-week curriculum taught by Dallas Police Officers. The subject matter focuses on six pillars of character: respect, trustworthiness, responsibility, fairness, caring, and citizenship. Dallas Police Chief David Brown said the program aims to “prevent negative behaviors among students by developing and implementing specifically tailored, age-appropriate curriculum to install life-long skills for healthy decision-making, problems-solving, negative peer pressure reversal, conflict management and character development”.